I admit to being something of a traditionalist when it comes to my barley beverages. I’m also generally a creature of habit – most of the time I know, and the regular bar staff know, what I’m going to drink, at least in general terms. Sturdy stouts, round browns, full-bodied bitters or a crisp weissbier – I only rarely stray from the path, and when I do it’s normally down to recommendation. Here, in Wells and Young’s Banana Bread Beer, is a classic departure from the norm – picked not for any of the usual reasons, but because it was so different. Brewed in Bedford, England, the label describes the beer as having “tempting banoffee aromas and flavors” balanced by “silky richness of a masterful malt blend and the peppery…hops”. 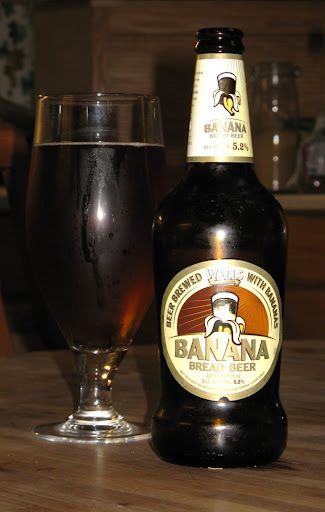 Made with fairly traded bananas, I thought this was going to be just another of those pretentious yuppie beers.